Homemade magnetic spindle depth stop for Taig mill ER16. 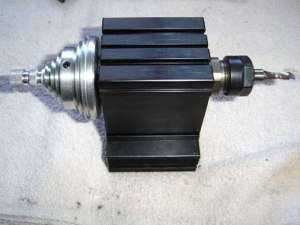 Assembly consists of a threaded rod, depth stop body with magnet, tapped pulley, and check nuts. Pulley is tapped to accept the threaded rod and stop body into the pulley and through the spindle bore. Depth is adjusted by turning the knurled check nut at the end of the pulley.